Today at SamMobile, we received the latest benchmark tests of the Galaxy S4 GT-I9500 (Exynos 5 Octa variant) with Samsung’s latest test firmware installed and the results are highly impressive. In previous test firmwares Samsung had clocked the Exynos 5 Octa CPU to 1.8GHz but in the most recent test firmware it has been decreased to 1.6GHz, as Samsung officially announced. Samsung has given a slight performance boost to the Korean variant of the Galaxy S4 by increasing the Exynos 5 Octa’s clock speed to 1.8GHz. Do keep in mind these benchmarks are not from the Korean variant (SHV-E300S) but from the international variant (GT-I9500) which is clocked at 1.6GHz and it still blows Qualcomm’s Snapdragon 600 SoC out of the water! 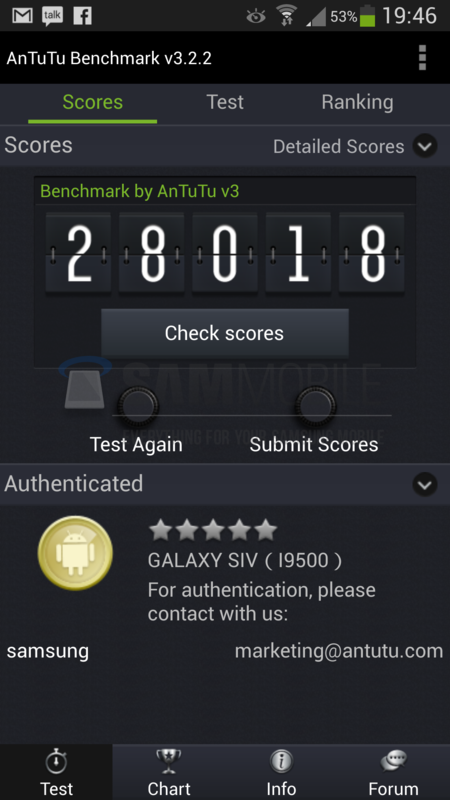 Our insider’s Galaxy S4 (GT-I9500) scored a whooping 28018 points on Antutu. The Snapdragon equipped Galaxy S4 (GT-I9505) scored 23607 points, as benchmarked by the folks at GSMArena. We expect the Korean variant (SHV-E300S) to score 30000+ points and one thing is for sure, the Korean Galaxy S4 SHV-E300S will be the fastest device on the planet. Now don’t be sad if your country is not getting the Exynos 5 Octa variant of the Galaxy S4 as you will not notice a performance difference in day to day tasks between the Snapdragon 600 equipped Galaxy S4 and Exynos 5 Octa equipped Galaxy S4. However, the Exynos variant will be faster while using high CPU extensive apps and will also be more power efficient thanks to ARM’s big.LITTLE technology. I’m waiting for the Galaxy Note 3. By the time that comes out Exynos Octa will be perfect along with the device. I can’t wait. That device is going to be the best thing to ever hit the market. At least that’s what I hope. Samsung hasn’t been nice to the US lately, giving us the Galaxy Note8 without phone capabilities. From today it is available in Italy, GT-I9505 variant. But, this time I not purchase it. I have all Samsung Galaxy S 1-3, but not this!! Why three different version and the best for Korea?? So can anyone tell me why exactly they have the I9505? Why would Samsung not use the Exynos in all of the variants? Why there’s only one screenshot? I think it would be fair enough if this article show screenshots from each chipset as they have had compared 2 different chipset. Does anybody know when the I905 will be released in UK? 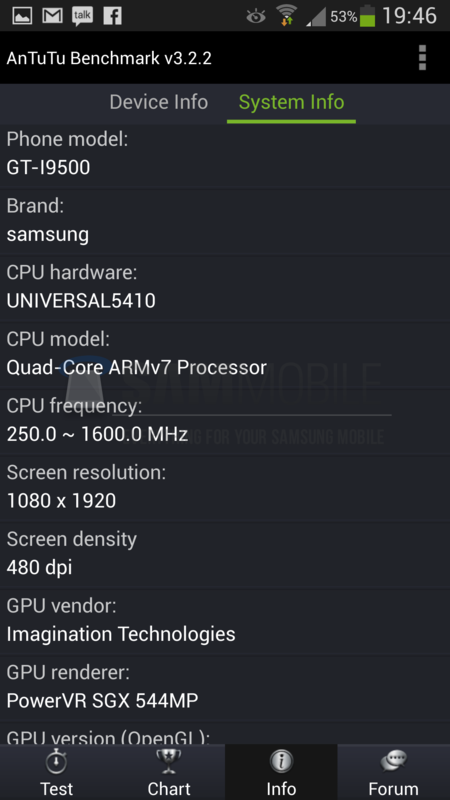 GT-I9505 – Snapdragon 600 1.9 GHz with LTE? 1. Probably on the last week fo April, if not then May. 2. Yes, read the article above. It is 441, and you mean ppi, not dpi. Now I am confused. I thought all exynos 5 octa would support LTE… Why make the GT-I9500 without LTE??? That seems too stupid. I think it can do more than that. Quad A15 should be able to get a score above 30000, so there is still some tuning left to do by Samsung. I really hate that Samsung doesnt bring the Exynos version to the Netherlands, at least not from the beginning. Now I´m having a hard time to choose between the HTC One and Galaxy S4. I’m curious if Samsung is going to repeat this Snapdragon/Exynos drama with the SGN3. …and pity FM Radio is supposedly taken out from ALL of the versions. If the Korean version has FM Radio, I can consider it, since it has +200 Mhz on the CPU already AND LTE (global bands) working. I do not think it will not have FM Radio function in Korean Edition of Galaxy S4 or LTE (global bands). Instead, it will have T-DMB antenna and Korean carrier LTE band only. Korean rarely listen to radio by phone…..
Actually all Korean Edition mobile phones are depended on Korean carrier. oh, my information is only for SHV-E300S,SHV-E300K,SHV-E300L (Korean Editions). Just buy Sony MW600 bluetooth headphones. It has FM included. I have it and it’s very good. You won’t be able to record the radio audio though.